"Sigourney Weaver is going to help us!" That's a hilarious quote from Ellen DeGeneres in Finding Dory, one of Pixar's best sequels & one of their best films. DeGeneres reprises her role as the forgetful Dory, & 1 year after teaming up with Marlin (voiced by Albert Brooks) to find his son, Nemo (voiced by Hayden Rolence), she is helping raise Nemo. One day, she remembers her parents: Jenny (voiced by Diane Keaton) & Charlie (voiced by Eugene Levy), eventually remembering that they lived at a marine institute in California. 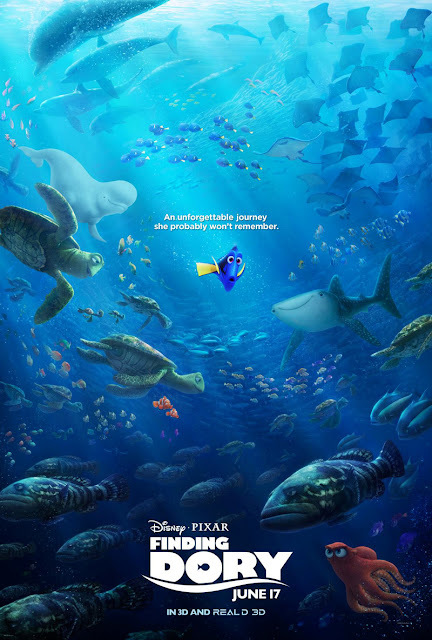 Now, Dory, Marlin & Nemo must travel across the Pacific to find Dory's parents, encountering old friends, such as Crush (voiced by Andrew Stanton) & Squirt (voiced by Bennett Dammann), & an octopus named Hank (voiced by Ed O'Neill) along the way. DeGeneres, Brooks & O'Neill's voice talents were spectacular, & the marine institute cameo narration by Sigourney Weaver was one of the many highlights of the film. The direction from Andrew Stanton is spellbinding, along with the screenplay by Stanton & Victoria Strouse. The film score by the incomparable Thomas Newman was one of his absolute best, along with his scores to The Shawshank Redemption, American Beauty, In the Bedroom, & Finding Nemo. And the animation, as it is with all Pixar movies, is astoundingly beautiful. This is one of the best animated films of the year so far.